I am so excited to have a giveaway from my new sponsor - Sew Obsessed!!! They have gorgeous fabric and great pricing. and they just opened their online shop this month. trims & notions, and pre-cut kits. Guess what Sew Obsessed is giving away??? 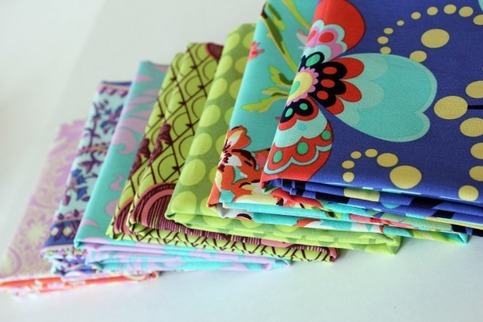 6 Fat Quarters from Heather Bailey's Nicey Jane Collection!!!!!! This GIVEAWAY will end on Tuesday, May 31st at midnight PST. I have to have the 1/2 yard bundle - Sugar Line. I'm visiting my mom in August and we are making a quilt for my bed. I absolutely have to have this material! I now follow the Originate and Renovate blog. Great ideas! Ooh, I love the Country Picnic and Country Picnic 2 I would probably go with the 1/2 yard of that collection. They have so much fun fabric it is hard to choose! love the 1/2 yard bundles - everything already matches - perfect! I want that Nicey Jane Slim Dandy Blue fabric! Ohh- the fabric is all so beautiful! I love the Nicey Jane Pocketbook pattern the best! I also liked Sew Obsessed on facebook!! I love the Soul Blossom fabric!!! 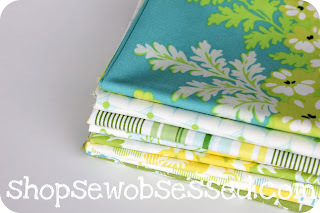 Sew Obsesses has such beautiful fabric! Thanks for the giveaway! I became a follower on the sew obsessed blog! I love lots and lots in their shop, but I think I MUST HAVE what they are giving away! TheHeather Bailey's Nicey Jane Collection.Those fabrics look so nice TOGETHER! I think I am digging their bundles! The half yard bundle of Nicey Jane in pink is melting my heart!! I love the Lotus tunic and cami pattern. I really want to make my own dress and this pattern is exactly what I envision wanting to make. I've got my eye on the 'Folk Life' FQ bundle - love the colors! I love the Amy Butler -Soul Blossom Twilight Peony Amaranth, so beautiful! OOOOH! I like the Fat Quarter- Sweet Tooth Candy Shop Pink/PR129! How do you choose??? Seriously. They have the most delicious and fabulous fabrics. Umm...maybe the pop garden fat quarter bundle or soul blossoms one or any of the nicey jane...see, hard to decide. Oh ... I must have Michael Miller's Fat quarter Bundle-Poppy Line! Or, a few yards of each!! I'm a new follower of Originate and Renovate! I "like" Sew Obsessed on Facebook! I like "Love Bali Gate in Pink"
I love soul blossom buttercups! I love the Nicey Jane Hop Dot in Cream, it would be the perfect fabric for a quilt I am hoping to make. Although I love the Michael Miller bicycles fabric as well. I just added Annie's blog, Originate and Renovate to my google reader. I love, love, love the Nicey Jane collection, so I would pick some of that to make something cute for my DD. I must have any of the Nicey Jane fabrics! I have had my eye on them for a while now. So excited for this giveaway!!! A MUST HAVE for me is the "Fat Quarter-Soul Blossom Peacock Feathers Bright Pear"!! BEAUTIFUL!! i "FOLLOW" Originate and Renovate!! I "LIKE" Sew Obsessed on FB!! I "FOLLOW" Sew Obsessed on Twitter!! 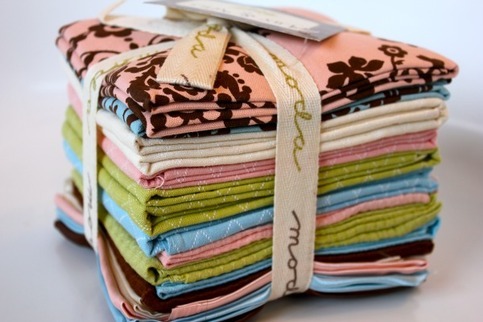 I love the 1/2 Yard Bundle-Love Collection by Amy Butler. My girls need some new summer clothes and these would be perfect! I like Sew Obsessed on FB! I love the Michael Miller/bicycles & more Bundle! I follow originate & Renovate blog. I love the lotus tunic & cami pattern. I just bought some fabric that would be perfect for that project. I love the Milkshake line and the fat quarter bundle o' dots!! I sew want the Learn to Sew Kit By Moda Home. I just got my first sewing machine and I can't wait to pull it out! The Nicey Jane is adorable! I liked Sew Obsessed on Facebook! I am loving the fat quarter line Nicey Jane in either green or pink! So pretty! I really NEED the "Learn to Sew Kit By Moda Home" from Sew Obsessed!! I FOLLOW Annie's Blog Originate and Renovate! I now FOLLOW Sew Obsessed Quilts on Facebook!